The mainstream media consensus seems irrefutable: there is an island of plastic waste floating in the middle of the North Pacific Ocean. But despite agreement on its location and a proliferation of claims about its size, no one can find it; not on Google Earth, not after weeks at sea. 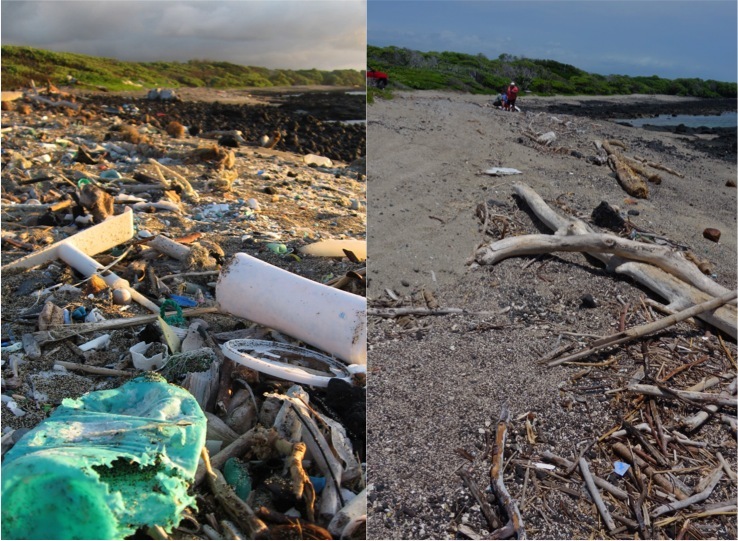 Marine scientists dismiss the trash island as misleading and inaccurate, but they cannot explain why it endures in the public imagination. 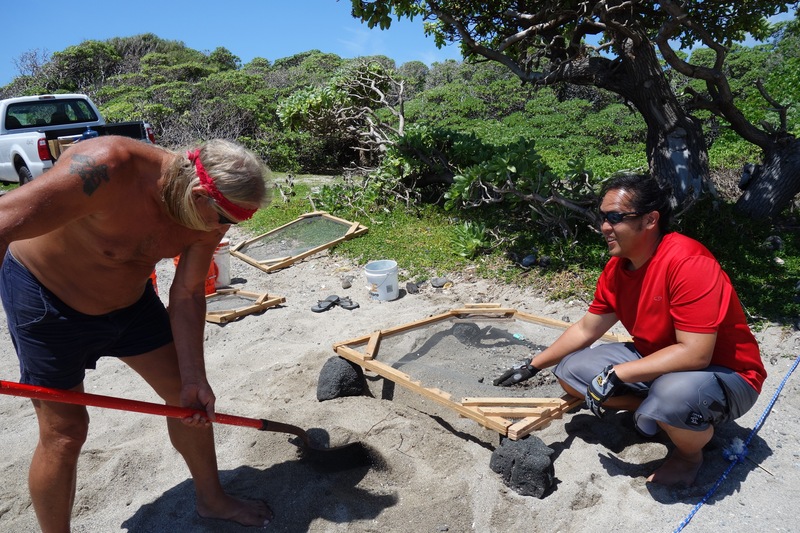 This talk draws on science and technology studies to move beyond questions of accuracy to explore how the trash island became and remains so powerful. In this talk, we will travel on a boat through the garbage patch, meet scientists, activists and even an architect, as the missing island variously appears as myth, plastic ‘soup’ and an island-to-be. 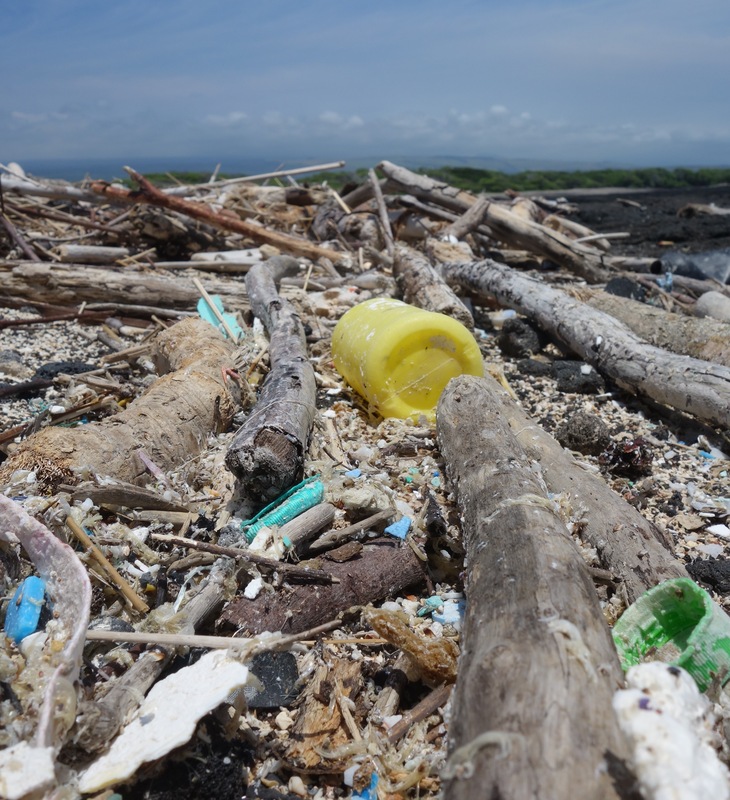 I will argue that the physical form plastic pollution takes at sea is inextricably connected to whether and how people care about it. Even missing things are powerful actors that shape both knowledge of global environmental crises, and the kinds of action that become possible in return. 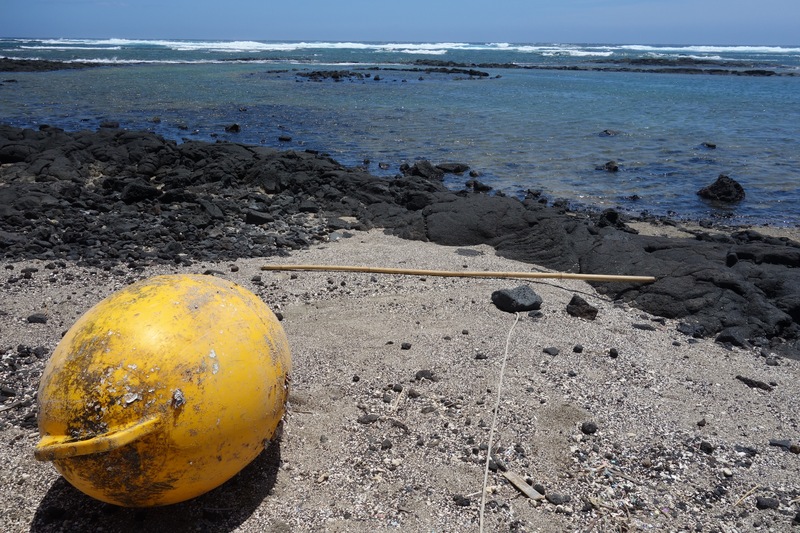 Almost a year to the day since my first visit, I find myself headed back to Kamilo, the famously plastic-covered ‘junk’ beach on the Big Island, Hawaii. It’s just after 6am, and I am bleary-eyed and over caffeinated, having just arrived on a date-line crossing flight from Tokyo the day before. I’ve signed up as a volunteer helping with a research project looking at the rate plastic is accumulating on the shore and have been promised a long day of hard labor shoveling sand. For the moment though, I’m using all my strength to keep my head and the truck roof from colliding as we bounce along the incredibly rough ‘road’ crossing the jagged expanse of a’a lava along the shore. 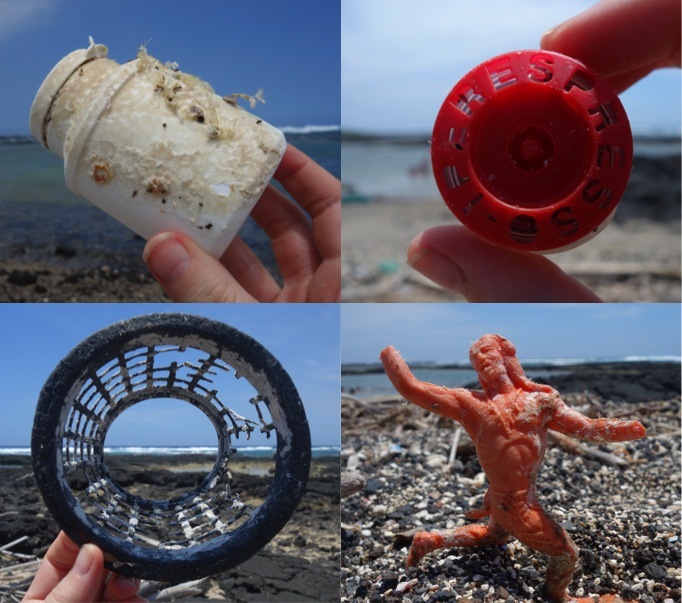 I am very curious to see how the beach has been changing, as Japan tsunami marine debris began reaching Hawaii’s shores just after my last visit. 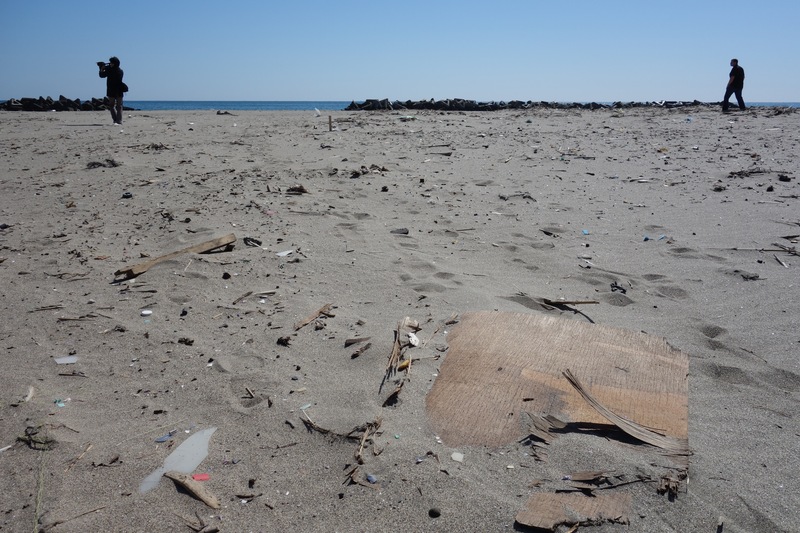 At the same time, I’ve noticed that news coverage featuring Kamilo tends to gloss over the history of plastic accumulating here, presenting images of large amounts of disaster debris that to me, just look like the beach as ‘usual.’ In any case, I am expecting to see more, not less plastic. 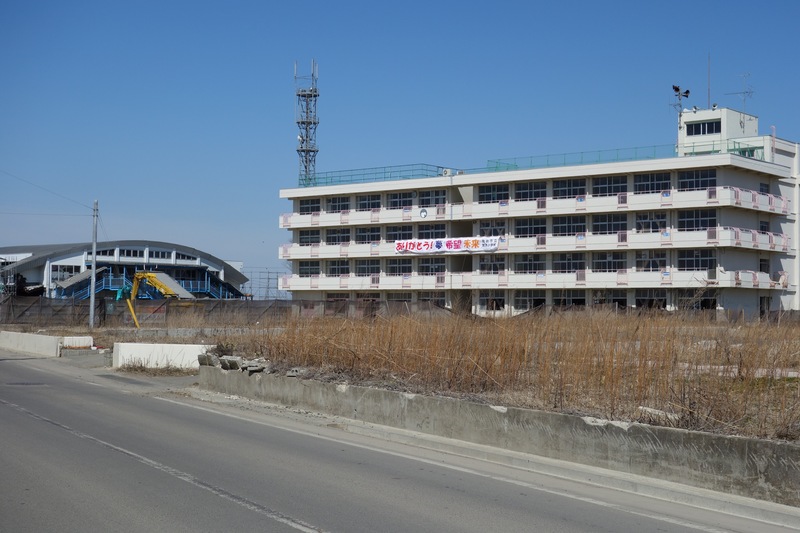 But arriving at the beach, I can’t help but notice that Kamilo appears much cleaner than last year. I didn’t quite manage to take a photo from exactly the same angle, but you can see how the row of debris along the high tide line contains noticeably more wood and coconuts than synthetics. You still can’t walk or look anywhere without seeing plastic, but there seem to be far fewer consumer objects like dustpans, umbrella handles, and shampoo bottles, and even the sand seems less synthetic. So if there’s supposed to be more debris arriving then why does the beach look cleaner? For starters, the Hawaii Wildlife Fund has been at Kamilo in full force, ramping up the number of cleanups both large and small over the past year. Thanks to their hard work, a lot of the most visible pieces have been picked up. But what about the microplastics, the bits that seemed to outnumber grains of sand, that were piled up several feet deep in places among the rocks? Most of them are still here, but they have shifted position. A storm in January drove all kinds of pieces, especially the small stuff, up into the bright green naupaka plants that line the shore, just out of reach of more usual tides. Though this keeps bits from being washed back out to sea, it also ensures that they are even more impossible to pick up, all mixed up with wood and soil and roots. 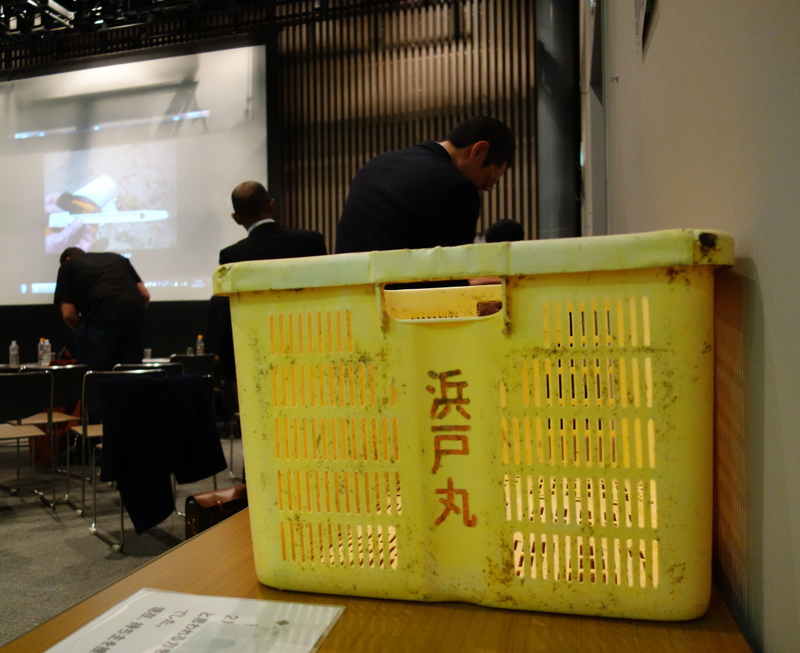 But cleaner looking is not clean, and plastic problems have not gone away. 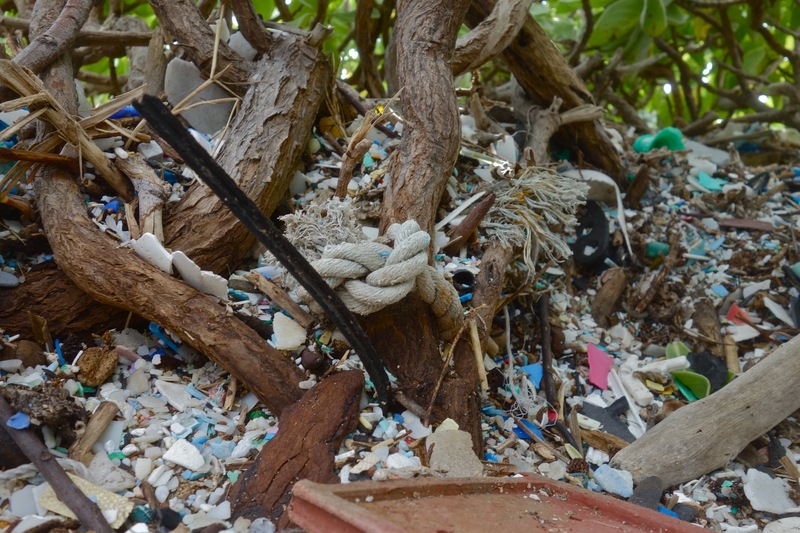 The plastic here has just become more like plastic in the ocean: less visible and less photogenic. I have to gather objects with my photos, like nets are used to concentrate plastics spread out across the surface of the sea. Picking up a white Japanese brand Lotte bottle that used to contain Xylotol gum (and still holds a foil packet of silica preservatives), I can’t help but think of how this object ended up in the sea especially once given the coating of coral-like bryzoa characteristic of open-ocean crossing. While such a discovery last year would simply have been evidence of distance travelled, this time I wonder about the conditions of loss and the stories these objects could tell. But science calls, and there’s little time for leisurely beachcombing. In practice, measuring the rate of accumulation involves sifting the top 15 centimeters (6 inches) of sand from five sizeable plots. At first sifting is a lot like playing in a giant sandbox, watching plastic bits and rocks get caught in the screens, dumping screen contents in buckets of water to see what floats. But as the day goes on and the tide comes in, the sand gets heavier and my arms turn to jelly. 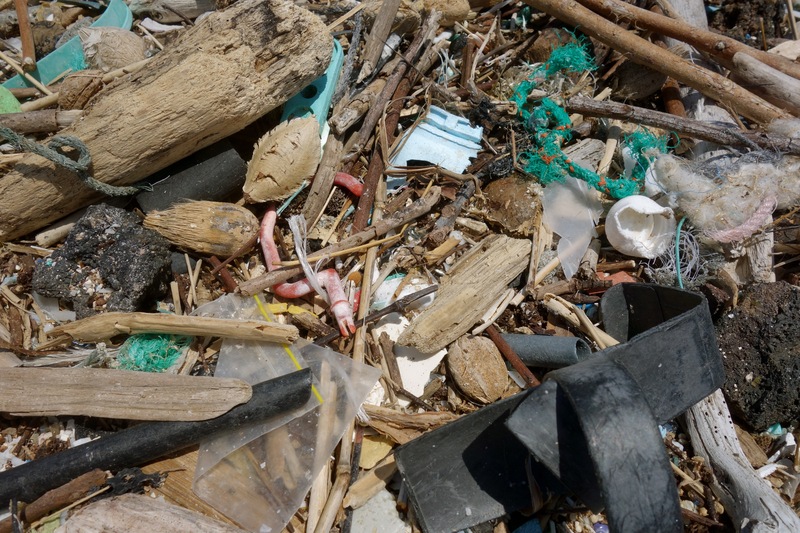 There’s little time to examine the plastics caught in the grid with so much sand to move. 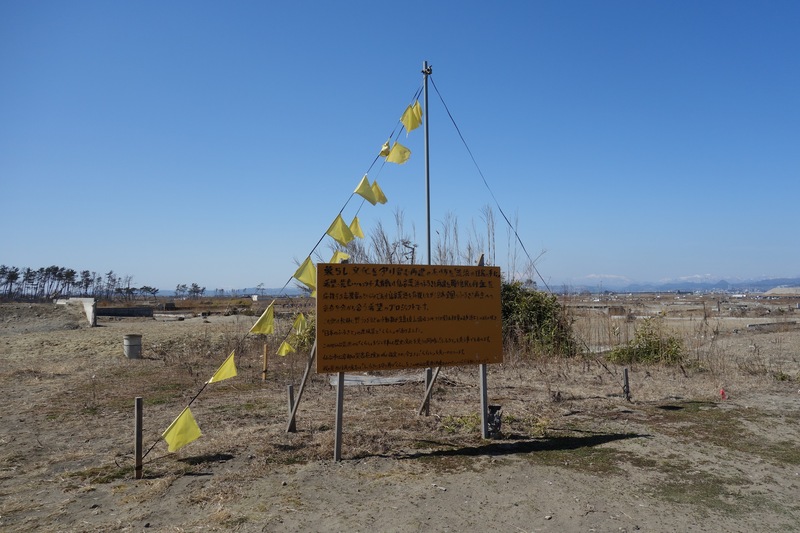 But one item is impossible to miss: a big yellow float mysteriously centered right in the middle of plot 3. After figuring out that the float’s position is a joke (and need not be brought back to the lab weighed as evidence of accumulation), we notice that it reads “MADE IN JAPAN” in big block letters. A moment of unorganized silence ensures as the possible implications sink in. Though reported to NOAA, the float will never be confirmed as of tsunami origins. 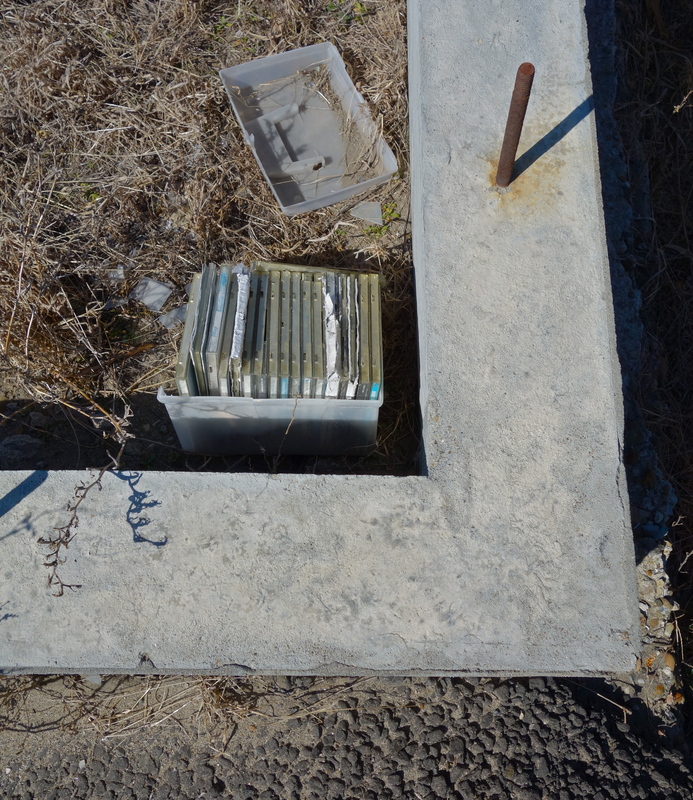 Despite all the news coverage, not a single item washed up on Kamilo has definitively been traced to the Japan tsunami. NOAA, it seems, is being rather stringent with the criteria: a found object must have identifiable markers like a person, company or place’s name; said entity must then be contact and asked to confirm that it is likely that they lost the item in question on March 11, 2011. 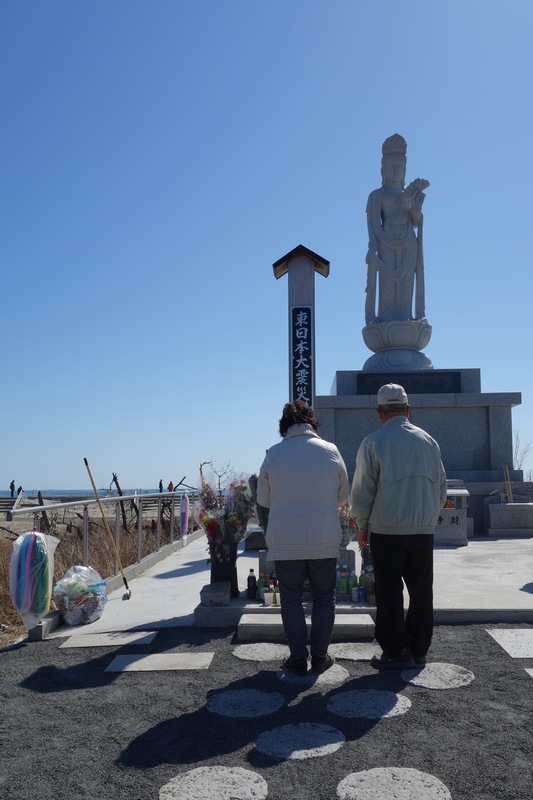 While this makes sense in terms of scientific objectivity (the floats for example are used by oyster farmers in both Japan and Korea), it is somewhat at odds with common sense understandings of those most familiar with the beach. 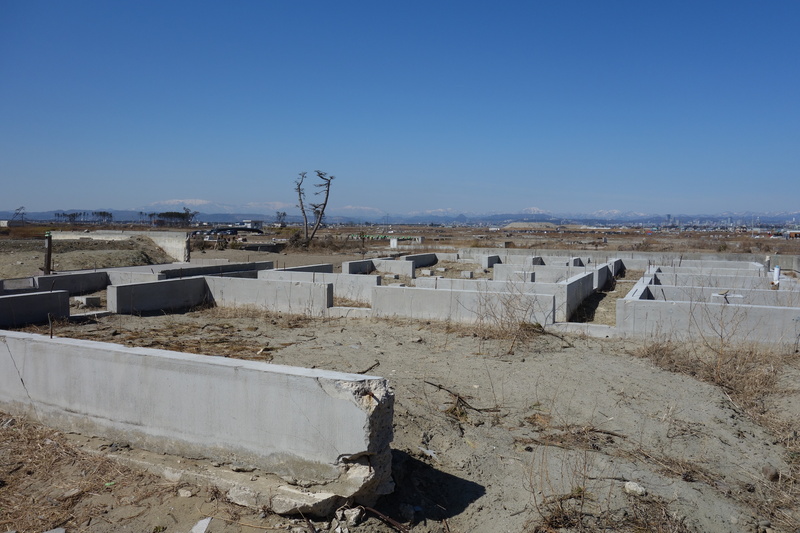 When three Japanese refrigerators washed up on the beach in close succession, and only one ever seen before at the beach, it doesn’t seem too far to reach to assume the conditions of their origins. But who writes their name on mass produced kitchen appliances? Had this been my first trip to Kamilo I might have been disappointed by the relative lack of spectacular piles of trash. Not finding what you’re looking for has a tendency to be kind of disappointing, even when the thing you’re looking for is plastic garbage. 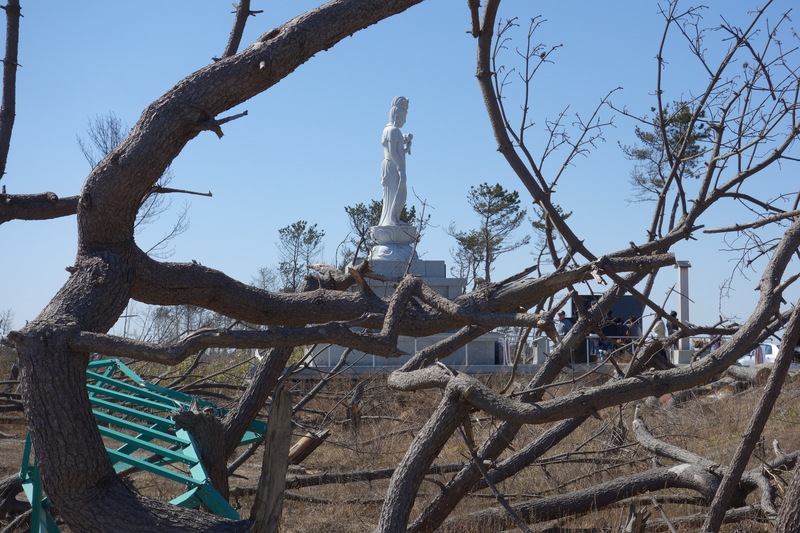 Just ask anyone that’s gone looking for the ‘trash island.’ But as a return visitor, I find the changes somewhat encouraging if only symbolically. Plastic problems are far from resolved, but should we manage to stop producing so much plastic, there’s hope for reducing the rate of accumulation that we’re busy trying to measure, for cleaning up at least the visible stuff if not all the associated toxins. We are not the only creatures to notice the difference. A very large Hawaiian Monk seal also visits the beach, coming up to rest on the sand. 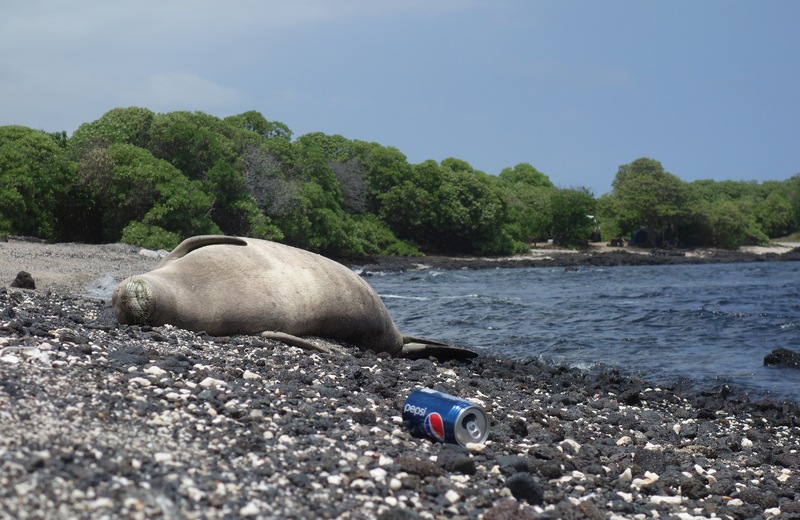 It’s a rare sight as monk seals are endangered because of entanglement with plastic, and only 1200 seals remain. 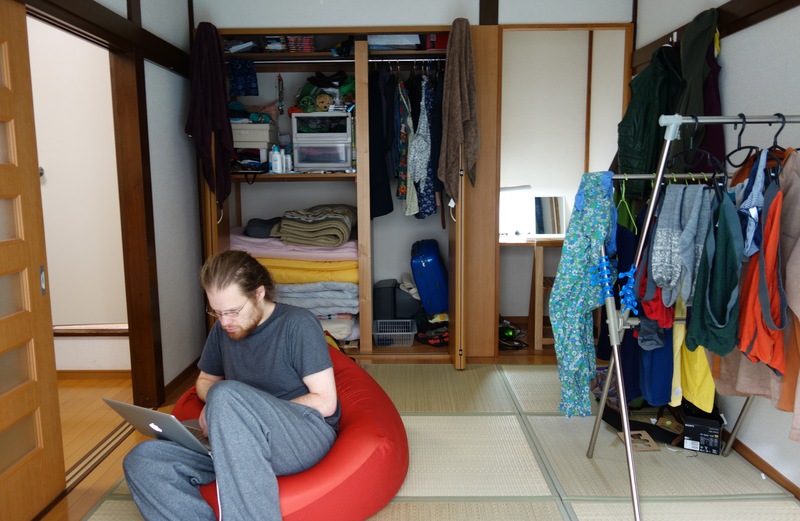 When I decided to move to Tokyo to share a 160 square foot apartment with my partner (and his bicycle) for six months I had mixed feelings. How were we going to do research and write dissertations – and not kill each other – all in a house that could fit in to one of the two bedrooms in our San Diego student housing apartment? But a romanticized vision of having A Life Experience (“remember when we were students and lived in that tiny room in Tokyo”), and the chance to live in a big Japanese city won me over. Or maybe it was all those articles about tiny houses and micro apartments I’ve seen circulating the internet. Videos tours of high tech apartments with moving walls and all kinds of hidden amenities like giant TVs that drop from the ceiling. Stories of individuals and families pursuing an alternative to the American Dream, trading picket fences and multiple bathrooms for freedom from debt, and in some cases, from foundations. These spaces embody the triumph of design over everything from rising housing costs (although one Vancouver small house I recently read about cost a whopping $250,000 to build) to problems of environmental sustainability, problems from which I am far from immune. So why not pack light and give living with less a try? 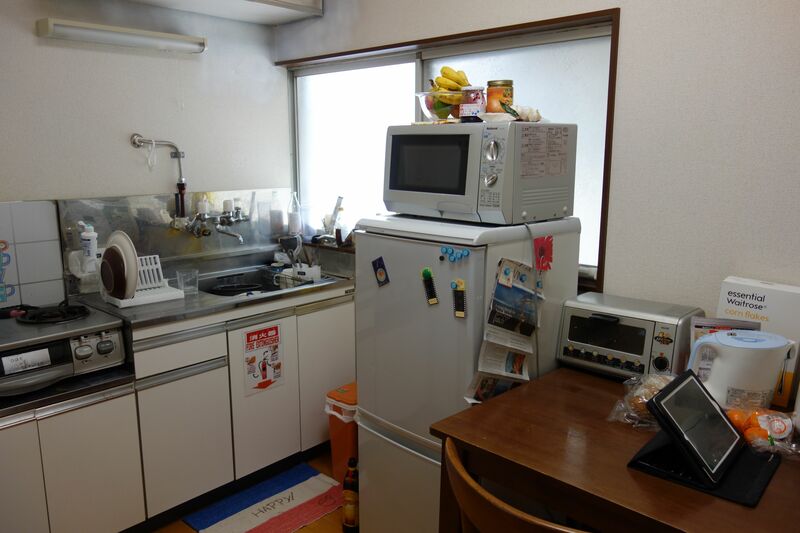 Our Tokyo apartment, while clean and cozy, is not exactly a showcase of exceptional design. It is carved out of the upstairs of an older house on a street so narrow the only vehicles are bicycles and even pedestrians can only pass single file in places. With houses practically touching, windows are opaque for privacy. I took the main room photo from outside on the communal balcony, the kitchen one from our bathroom. Stephen occasionally bumps his head on the low doorframes. We sleep on Japanese futon (which are simply folding mattresses), which we stow in the closet each morning (ok, more like noon) for maximum floor space. We have a two-burner gas stove, and a mini-fridge-microwave-fruit bowl tower. The bathroom sink faucet swivels to fill the tub, and more often than not, there’s laundry drying in the main room. And all of this is pretty unremarkable for a city where living in a small space is not a lifestyle choice, but more simply, a way of life. Buy groceries more often. With little fridge and cupboard space, you can’t stockpile sale price boxes of Annie’s shredded oats (not that they have those here), or make of ginormous vats of veggie chili for the freezer. Japanese grocery stores (like many I have seen in Europe) cater to this kind of shopping, offering half loves of bread, tiny bottles of mayo and miniature cans of corn (I saw ‘bunches’ of 3 asparagus spears at the store yesterday). You get to eat fresher foods, and whatever you feel like at the moment, but it costs more. Own less stuff. Shopping means considering not just if I ‘need’ something, but whether there is somewhere to put it. And this extends to books, which are usually an exception to my non-accumulation policy. Understandably, renting all kinds of things is pretty popular here, and with strict anti-piracy policies, video stores are still going strong (seriously, when was the last time you went to blockbuster?). Our local chain even rents CDs and manga. Do chores more often. When you have less clothing, you have to wash it more often. When you spend a lot of time on the floor, you are compelled to sweep it more often. When you only have two spoons…you get the picture. And if you look in the picture, you’ll see our laundry drying rack occupying precious floor space. With small washing machines and no dryer (as is standard in Japan and pretty much everywhere else I’ve traveled), all clothes hang to dry. Go out more. People in Tokyo almost never invite people to their homes (regardless of size). Restaurants, Izakaya and coffee shops are living and dining rooms. Parks, most famously Yoyogi Koen, are full of dance troops and music groups short on rehearsal space. Luckily, I am not the one that has to practice tuba outside in January (true story), and going out in an amazing food city is generally pretty fun. But it’s also expensive and I miss excuses to cook for my friends. Compromise to new extremes. We have very different sleep schedules. I am a morning person (at least in theory). I often wake up with sentences swimming in my head and do my best work before noon. Stephen is not a morning person (in theory or practice). He works best late at night, sometimes until 4am. But you can hardly walk in here when the bedding is out. So as a joke, I invented the 11-11 rule: either person can put the bed out after 11pm and ask for it to be put away after 11am. Except this is kind of the law now. Adjust in unexpected ways. Small is relative. Even after 6 weeks the apartment does not usually seem tiny, especially if the bedding and laundry are put away. It might just be getting off trains so full you can hardly breathe (for real), or leaving coffee shops where tables and sometimes elbows are touching. You quickly learn to retreat into headphones and adjust expectations. We’ve actually taken to sleeping on a single futon, so there’s less rearranging twice a day. And, as a bonus, I am extra looking forward to having a 325(!) square foot hotel room and queen bed all to myself on my next research trip. With romantic visions quickly drowned out by the incredibly loud snoring from the room next door, the practical lessons are that much clearer. It’s not the magical small house technology or clever cabinetry alone that makes for green living or happiness on a different scale. Yes, folding bicycles are kind of amazing, but so is figuring out you can use a hot sauce bottle as a rolling pin. More importantly, truly livable small houses are part of livable communities. Here we benefit from the multitude of amazing restaurants, from never being more than a few minutes walk from a grocery or convenience store. Tokyo could certainly use more public spaces, especially green ones, but I will most certainly miss living in a city where bicycles and pedestrians are the rule. At the end of the day, there’s a huge difference between giving up my oven/ blender/ books/ bed/ garden/camping gear etc. for a few months, and doing so permanently or without choice. So when Stephen hits his head on the door frame, and I sometimes have trouble falling asleep with the light on and someone playing video games two feet away (it’s research, really), it is with the knowledge that we can return to living in more than one room in the near future. We are obsessed with absolutes. Ban bottles. Zero waste. BPA free. A world with good and bad neatly slotted on either side. You are with us or against us. At the same time, we can’t do everything, so we applaud ourselves for tiny efforts. Refill a bottle. Bring a bag. Doing something is better than nothing, and maybe little moves can change the world, or at least make us feel a lot better. Thinking in absolutes while acting through small compromises is one strategy for dealing with a complicated world. We simplify to get by, living mostly by habit, as it is impossible to carefully consider each and every move. When it is time to think about change, we like lists. 4 facts you didn’t know about plastic. 10 canned foods to avoid. 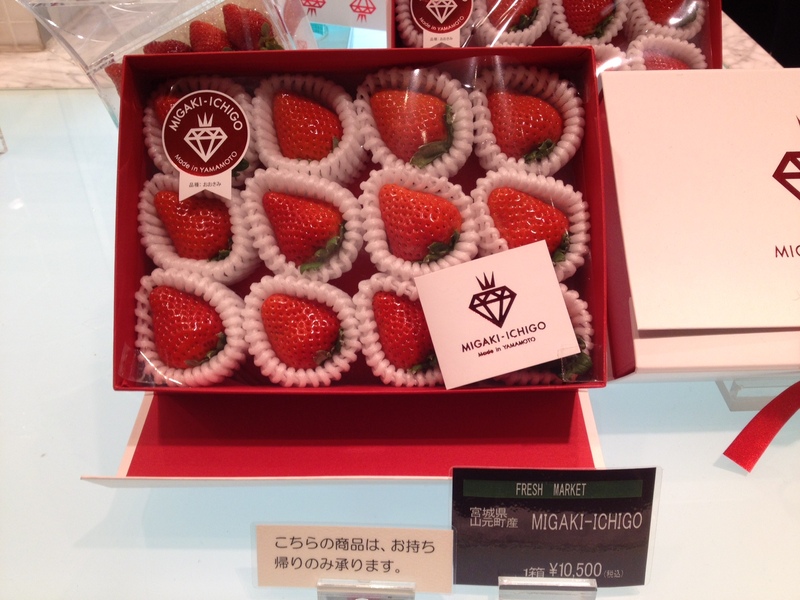 Suggestions for shopping that neatly organize the world into good and bad objects. Easily digested consumer choices that fit with how we already live. But what needs to be challenged is how we live, and how we live with plastic. We need to make big moves, but not totalizing ones. Responsibility cannot come from unbendable rules but from constantly engaging with – and responding to – the messy world we have made. We need to think more of rather than less of plastic; deal with not demonize; approach as powerful, not just bad. 1. Plastic has a life of its own. It will always do things that humans can’t control. Getting into oceans, escaping from our best plans to recycle or bury it. To justify production or use based on assumptions of best-case scenarios is to underestimate plastic’s own powers. 2. Plastic is toxic. Plastic is not stable or inert; it leaches and attracts chemicals. Like household bleach, it is sometimes necessary in small doses, but even tiny amounts of the chemicals in plastic can cause devastating effects to living creatures. To be free of BPA is to be full of something else that just hasn’t yet been deemed dangerous. 3. Plastic is durable. Plastic does not always remain in a form or place that is immediately useful to humans, but it does not disappear. It is often made to break or made for single-uses, but it could be made differently. To confuse disposable with short-lived is to fill the world with plastic.